Many a time,people who have listened to public speeches often ask: How can I be a good public speaker? Can I ever be as good as this speaker? Have you ever felt this way? Do you what to know how to be a good public speaker? A long time ago, I read a book which title I can not remember now,and it says in part as I copied " To attain accurate speech in life,you must have the logic of a Philosopher,the language of a poet,the memory of a Lawyer, the voice of a tragedian,and the gesture of the best actor. This in all, is how to be a good public speaker. You must be a voracious reader as though everything depends on reading to get the skills of a Lawyer,a Tragedian, a Philosopher,and an Actor. Public speaking involves boldness and courage. A good public speaker has no fear in himself when he wants to speak. This is because,listeners do not believe what they hear from trembling tongues. You must speak with conviction to enable your listeners take home some points,and believe in you. Humor,is a very important aspect of public speaking. The truth is that you cannot get the attention of your audience if their hearts are not arrested! First make them be at ease,and make them feel calm. A good Philosopher begins with a fitting illustrations that touch the heart ,anytime he wants to speak or teach. This act is to make his listeners also his followers. So,try the act of a Philosopher if you want to be a good public speaker. 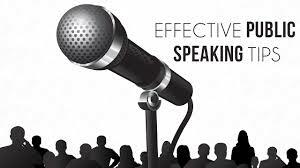 A good public speaker must have a convincing voice. This means that your voice must be loud enough to reach the ears of every one of your audience. This is because,while some people are sitting,looking at you,their minds are elsewhere. So,your much voice is needed to bring your audience in,and keep them! This is how to be a good public speaker! Can a teacher go to classroom without his teaching material in his tongue? Can a farmer ever go to his farm without his sharp cutlass? surely no! The same act is applicable if you want to be a good public speaker. My point is : To be a good public speaker,you MUST read very well your material, and have your message coated in your tongue. There are no short cuts about it on how to be a good public speaker,other than knowing and having the act of an Actor, who uses voice modulation,and physical demonstration as required,and having the voice of a Tragedian!! !